Umm, coleslaw. Now that summer is on the way in our part of the world, we can’t stop thinking about it. And variations on it. Collard greens are a close relative of kale, that rock star of veggies. And like kale, they’re flavorful, nutritious, and versatile. Use them in coleslaw, and you’ll find that a familiar dish has acquired an entirely new personality. That’s a good thing. Because with Memorial Day right around the corner (officially kicking off cookout and picnic season here in the US), you probably need all the coleslaw recipes you can get. Cabbage usually forms the basis of coleslaw, but there’s no rule saying it’s required. Other greens can make a tasty substitute. Collard greens (a close cousin of kale) make for a particularly interesting variation. Lots of eaters have never encountered collard greens in their raw state (though many have enjoyed them cooked). Their flavor is more intense than that of cabbage, and they combine especially well with spicy radishes. When served as a side, this dish makes a great accompaniment for any traditional cookout main course, such as BBQ or burgers. It would also make a delicious bed for fish or seafood (crab cakes and salmon in particular). We got the idea for this dish from a similar recipe we found in an old issue of Bon Appétit magazine. Prep time for this dish is about 15 minutes. The recipe yields 6 to 8 servings. You can serve this coleslaw immediately or refrigerate it in an airtight container for a few hours. Serve chilled or at room temperature. Leftovers keep for a few days if refrigerated in an airtight container. Wash the collard greens and shake them dry (or spin them in a salad spinner). Remove the stems, then cut the collard greens into thin strips or shreds (using the method known as “chiffonade;” see Notes). Place the collard greens in a large bowl. With your hands, massage the greens for a couple of minutes to tenderize them (much as you would massage raw kale; you can skip this step if you wish). Wash the radishes and shake them dry. Remove the greens and root ends (you can chop the greens and add them to the collard greens if you wish). Slice the radishes thinly, then add them to the bowl with the collard greens. Wash, trim, and peel the carrots. Shred them using a box grater or a food processor. Add the shredded carrots to the collard greens. Peel the shallot, cut it in half lengthwise, then cut it into thin slices. Add the chopped shallot to the collard greens. Toss all the ingredients together to mix them thoroughly. Make the dressing (it’s easiest to shake the ingredients together in a small lidded container, as we describe in this step, but you could also whisk them in a small bowl): Add the olive oil, vinegar, celery seed, mustard (if using), red pepper flakes (if using), salt, and black pepper to the container. Secure the lid tightly, then shake vigorously until the ingredients are well mixed. Pour the dressing over the collard-greens mixture, then toss until all the ingredients are well coated. Plate the coleslaw and serve. We often add a few slices of radish as garnish. You could add a couple cloves of garlic to the slaw if you wish. And/or a jalapeño pepper or two. 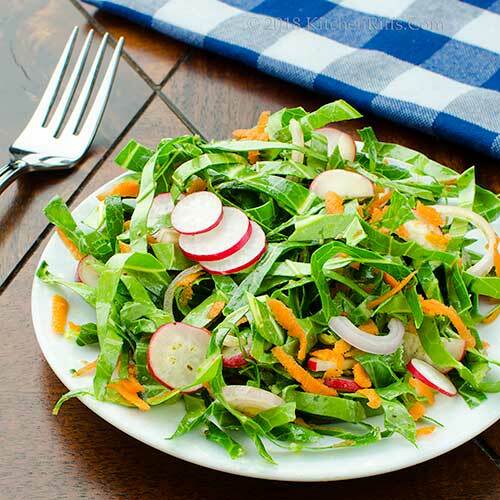 We usually don’t add sugar to vinaigrette when we make coleslaw, but you may prefer to. If so, add a teaspoon when you make the vinaigrette in Step 5. We’ve never made collard-green coleslaw with mayonnaise. But if you prefer a creamy slaw, we no reason why it wouldn’t work. Some recipes for vinaigrette-style coleslaw call for heating the vinaigrette before adding it to the greens. Again, this is not something we do, but if you prefer to make yours that way, feel free. We do, however, make a version of hot slaw with bacon. You could use our recipe for that dish, Hot Bacon Coleslaw, but substitute collard greens for cabbage. If you don’t care for celery seed, just omit it. But we like to use it in coleslaw – we think it adds a lot of flavor. We use kosher salt in cooking. It’s less salty by volume than regular table salt (the crystals are larger, so it packs a measure less tightly). If using regular table salt, start with about half as much as we suggest. But, as always, season to your taste, not ours. Both collard greens and kale belong to the acephala group of Brassica oleracea vegetables (cabbage is in a different cultivar group, though closely related). Kale has become one of the “it” vegetables in the past few years. Collard greens? Not so much (though they’ve always been popular in traditional American cooking, especially in southern states). Collard greens (like kale) can be a bit tough when raw. So we usually massage them for a couple of minutes to tenderize them, as noted above. Collard greens have a milder flavor than kale (although it’s still plenty hearty). They’re also a low-calorie veggie that is chockful of vitamins and minerals. “Glad we wrested these collard greens from their maws,” I said. “Though I saw the head rabbit thumping his hind paw at you in irritation,” said Mrs K R.
True. I could wind up in the hopper. Your basic idea is appealing, but I think I would still prefer cabbage. Local radishes are one of the very early vegetables here, so this could really be a spring thing! Hi Mae, cabbage is so good it's hard to replace it in coleslaw, isn't it? This is a nice change, though. :-) Thanks for the comment. This looks like a delicious alternative to regular coleslaw! Have a great rest of your week! Oh I love the idea of a cole slaw with Collard greens! What a great idea. And a less heavy dressing too looks like. Great for any upcoming picnic! Hi Kelsie, it's a fun dish! Really interesting flavor. :-) Thanks for the comment. Hi Evelyne, it's a super way to use collard greens. Perfect picnic fare. :-) Thanks for the comment. I just made collard greens for the first time and loved them. Look forward to trying this recipe soon! Hi Pam, collard greens are good, aren't they? We usually cook them, but they're interesting when served raw, too. Thanks for the comment. I like the sound of a hot slaw with collards. I don't think I've eaten them raw. Thanks for the inspration! So I've never tried collard greens! Cooked or otherwise. This may remedy that...and as for those rabbits...Manservant (AKA Rabbit Catcher) has been having a challenging year!And we haven't even planted the garden yet! How very fresh and crunchy! I love that dressing too. Have never used celery seeds in salad dressing, can't wait to try it! Hi Lydia, raw collards are a lot like raw kale, but more tender and the flavor is less assertive. They're wonderful in hot slaw! Thanks for the comment. Hi Abbe, sorry to hear the rabbits are giving Manservant fits. We totally know what that's like. :-( Thanks for the comment. 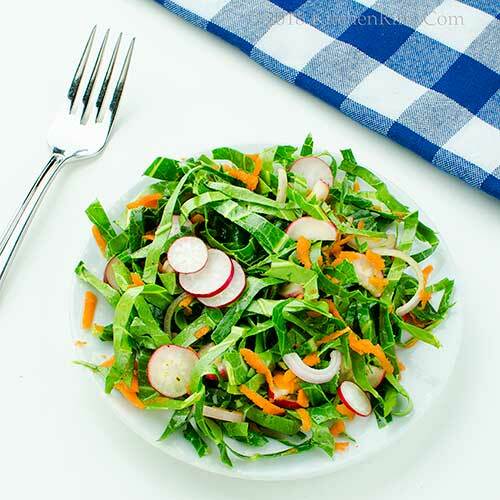 Hi Angie, celery seeds is wonderful in this kind of salad -- really nice flavor. Thanks for the comment. Hi Lea Ann, anything you can make with kale, you can make with collard greens. They're good! Thanks for the comment. John, you must be like me, keeping hordes of old food magazines in order to have access to new recipes (I've run out of room to store them!) I don't think I've ever noticed 'collard greens' before in a market- looks like I must try them. I just saw a recipe for a vinaigrette using passion fruit, ginger and chili- maybe that variation might work well? Hi Fran,about a decade ago we threw out a bunch of old food magazines going back to the late 1970s. Broke my heart, but it was really past time to do so.And that vinaigrette sounds terrific! Thanks for the comment. Hi Mimi, very healthy! :-) Thanks for the comment. I've only have cooked collard greens. Raw in a salad is something I must try! I'm always on the hunt for new salad recipes, thanks John! Hi Deb, we mainly cook collard greens, too, but raw is a fun change. Thanks for the comment. I really like the sound of the dressing you've put on this, will definitely be giving that a try! I am fascinated with this slaw John! I've never changed my cabbage to anything else - so outside the box I love it. We love our greens :) Hope you have a nice holiday weekend. Let the grilling season begin! I've never met a slaw I didn't like! Thanks for the yummy, unique slaw recipe to try. You're right---perfect for the holiday weekend!! Hi Sherry, collard greens are less intense than kale, but if you really don't like kale then cabbage would probably make more sense. :-) Thanks for the comment. Hi Caroline, we love this kind of dressing for coleslaw! :-) Thanks for the comment. Hi Tricia, dark greens are great, aren't they? So nice to use them in a different way, too. :-) Thanks for the comment. Hi Liz, a good slaw can be so interesting, can't it? So many different flavor profiles you can use! Thanks for the comment. Hi Jean, radishes are good! We love their peppery flavor. :-) Thanks for the comment. We love the usual cole slaw, in fact, I just made some last night. I like your twist on it but don't think I've had collard greens since living in Louisville. Love the radishes in this, but I'd omit the carrots. I will be looking for the greens at the store! Thanks for sharing. Hi Pam, collard greens are good! And fun in this dish. :-) Thanks for the comment. This is an awesome version of cole slaw. I never understood people who don't like it! Such a creative idea and great recipe! We are all about non - white and creamy coleslaw options. Safer for the summertime festivities. Also loving your little kick of red pepper flakes to spice things up a bit. Wishing your family and safe and happy holiday weekend. Hi Ashley, it's a fun dish, isn't it? Thanks for the comment. Hi Bobbi, we really like spicy, so we add red pepper flakes whenever we can. :-) Thanks for the comment. Hi GiGi, LOVE olive oil! It has such wonderful flavor. :-) Thanks for the comment. I love any kind of coleslaw. This looks great. Hi Peachy, isn't this nice looking? Nice tasting, too! Thanks for the comment. Hi Laura, greens are wonderful! As are radishes. :-) Thanks for the comment. Your coleslaw looks so fresh and exciting. I love radishes. Hi Amalia, radishes are SO good, aren't they? Always looking for a new way to use them! Thanks for the comment. "Coleslaw with attitude"...you certainly got that right! :) Raw collard greens in a coleslaw is quite genius. I actually like my greens raw rather than cooked, but have never try collards. Great recipe John! Thanks! What differentiates a slaw from any other salad? Are you saying that raw collard greens are more like cabbage than they are like lettuce? If you are, I'd be totally down with that. Hi MJ, you'll LOVE raw collard greens in slaw. Or salad. Or whatever. :-) Thanks for the comment. Hi Jeff, raw collard greens are definitely more like cabbage than lettuce, but more so. They have a very distinctive flavor, whereas lettuce is MUCH more mild. And good question regarding difference between slaw and salad. I've always thought of slaw as shredded/chopped and salad as having bigger leaves (and a less aggressive dressing) but don't know if that in fact is accurate. :-) Thanks for the comment. I love this recipe. I alway think of collard greens as a green that frequently gets overcooked and mushy. 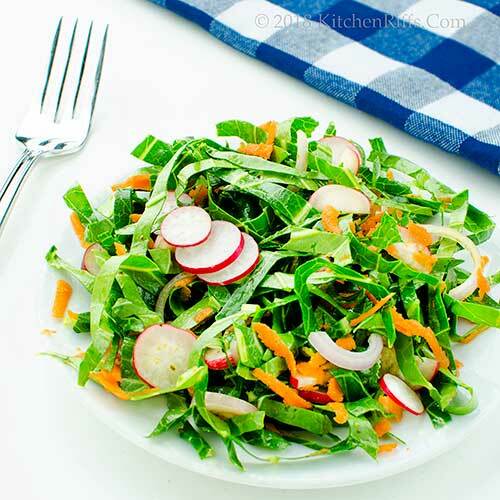 I love the idea of making a slaw with the raw veggie. I'm off to look for some collard greens!!! Intriguing! I don't know if I've ever tried collard greens raw, to be honest. This does look darn good. And the salad/slaw is beautifully arranged. Hi Dahn, collard greens cooked with ham or a pork hock are pretty good when they're cooked until they fall apart. But, ham. :-) Thanks for the comment. Hi Frank, collard greens are usually cooked, but (like kale) can be fun raw in a salad. They're an interesting twist, that's for sure. Thanks for the comment. Changing up a slaw like this recipe is perfect for a picnic, it’ll be unique to the table. 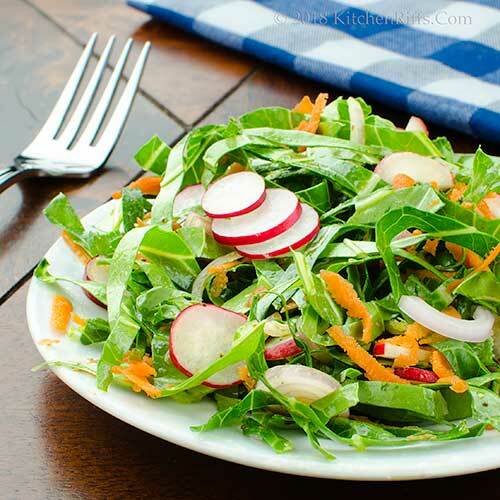 I love a good bite to my greens and the crunch from the radishes sounds fantastic. Hi Eva, the collard greens definitely add a flavor twist to slaw! And I can't resist radishes. :-) Thanks for the comment. This is such a flavorful and healthier twist to the classic one, very suitable for the season. Thanks John and happy summer. Hi Amira, Happy Summer! :-) Thanks for the comment. I am one of those eaters who has never had collards in their raw state! I will make sure to give them a try like this - looks delicious! Hi Amy, collard greens are usually served cooked in most recipes. But they make a nice change of pace when served raw! Thanks for the comment. That's interesting. I've never tasted raw collard greens - which seems funny now that I think of it. I've cooked with them, but it has never occurred to me to taste one before cooking. I should probably be embarrassed about that. Anyway, I'm always interested in adding something new to my raw vegetable line-up, so thank you for pointing me in this direction! This sounds like a wonderful, summery salad! I like the idea of this, it sounds so fresh and tasty. I don't mind bypassing the mayo version as it can be a little too much at times. Hi Emma, we do like mayo-based slaw, but I'll bet the vast majority of the time we have a vinaigrette-type slaw. Thanks for the comment.